Creative pregnancy announcements are all the rage these days, but these couples take their announcements to the next level of awesome. 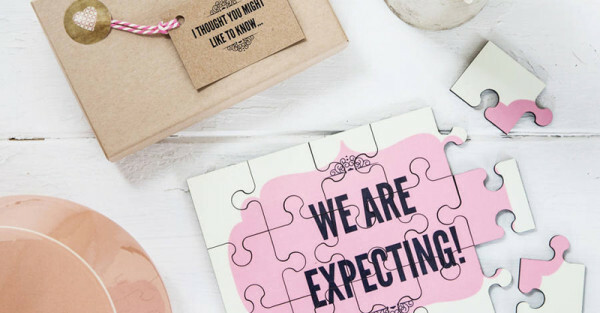 Welcome to our round-up of the very best ways to announce a pregnancy, Babyology style. The Murrays are too adorable not to love and their YouTube video announcing not one, but two pregnancies in the family had us all dancing and awwing along. You won’t be able to listen to Shut Up and Dance by Walk the Moon without thinking about the Murray’s version. Another great pregnancy parody we love is this Britney Spears Oops I Did It Again announcement. Nothing says, “We’re having a baby,” quite like a music video spoof. Who doesn’t love a good puzzle, especially one that comes with such an exciting announcement? Give it your friends and family to piece together the great news. We stumbled upon this one at Lou Brown Designs. Kristen Williams and her husband Corey are no strangers to YouTube but Kristen pulled a fast one on her partner by using a taste test to announce her pregnancy. A blindfolded Corey was asked to guess the different foods and when he came across baby food, he was caught off guard in this adorable surprise video. Simon Schaffrath created the ultimate pregnancy photo shoot by using his wife’s growing belly as the inspiration for several beautiful landscaping shots. With a hint of body paint, a few cleverly placed props and photoshop, the dad-to-be designed four portraits to hang in his son’s room and to remember this special time in their lives. Cue the goosebumps! Gavin and Judy Holt take creepy pregnancy announcements to a whole new level with their carefully-thought-out horror movie announcement. Who knew the sound of a baby’s heartbeat and a silhouette of a growing baby bump could be so terrifying? 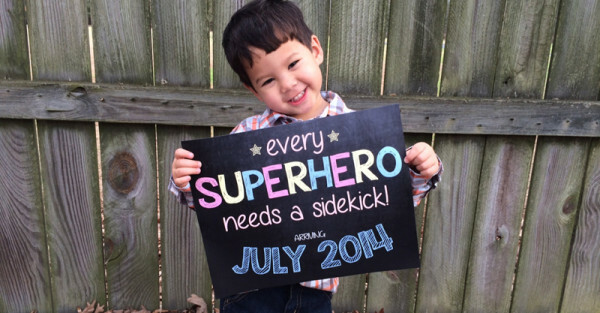 Sibling pregnancy posters are all the rage and this “every superhero needs a sidekick” poster is definitely one to Marvel at. We uncovered this one at MMason Designs. 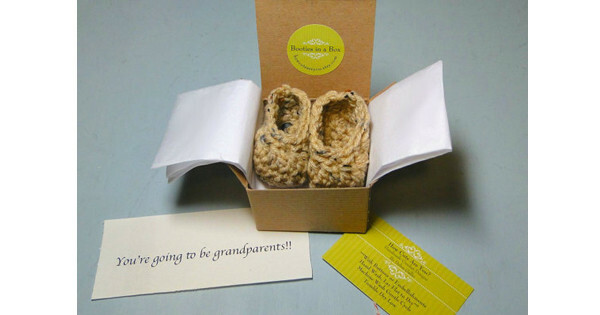 Let the booties speak for themselves with this special Booty in a Box set, the perfect set for grandparents-to-be. How Cute Are You have a beautiful set for $19. This scratch card may not come with the promise of money but it certainly reveals an exciting message. 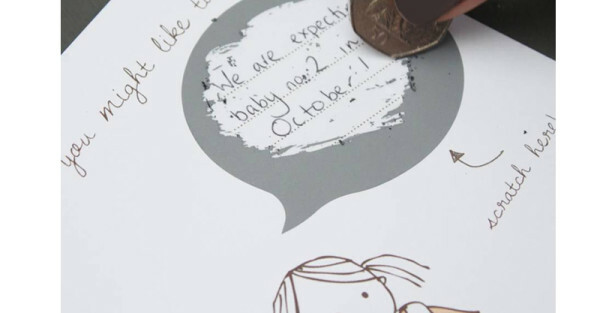 We love Lou Brown Designs scratchie pregnancy announcement – the perfect gift to give to family members as a way to announce your news. Chad Reay thought he was getting an Apple Watch, but his wife, Catie, surprised him with a positive pregnancy test instead. And his reaction is just beautiful! Looking for more adorable ways to announce your pregnancy? Check out our previous pregnancy announcement round-up post and browse through our Etsy finds for more ideas.